Vertical pieces fixed between hand-rail and string, or hand-rail and treads, as the case may be. The moulded rail fixed on top of ballusters, with them completing the ballustrade, and forming a protection at the edges of steps and landings. A short upward curve in a straight length of hand-rail (A, Fig. 170). A short forward curve, the reverse of a. ramp (B, Fig. 170). A combination of the two foregoing curves (Fig. 170). A horizontal curve in a hand-rail. A twisted curve, in which the hand-rail, while being curved on plan, rises at the same time with the stairs. A hand-rail round in section, except on the under side, which is flat. A hand-rail finished with a vertical scroll. The same finish fixed horizontally (Fig. 159). A moulded circular cap fixed on top of a newel, to which the hand-rail is mitred. A thin flat bar of iron sank into the under side of hand-rail. Nosing Line, which must not be confounded with "Line of Nosings," is a line drawn upon the string for the purpose of setting out the steps thereon (Fig. 160). Staircases are of several kinds, and the names given to them are based upon the appearance of the stairs in plan, or upon the way in which their strings are constructed. In houses where the floor area is limited the stairs are generally compressed into the smallest possible space, and not infrequently very awkwardly placed. The staircase best adapted to small buildings is that known as Dog-leg Stairs. This style is shown in Fig. 157, its not altogether euphemistic name being derived from the supposed similarity borne by the string in elevation to the hind leg of a dog. In the illustration some winders are shown in dotted lines, but where it is possible to obtain sufficient "going" it is much better to have two straight flights and a half-space landing. Winders are a frequent cause of accident, owing to the diminished tread, and should not be used except in unavoidable cases, and should also be placed at the bottom in preference to the top of a flight; that is as in Fig. 159, and not as shown in Fig. 157, although there is great diversity of opinion on this point. To avoid dangerous winders, stairs are sometimes treated as shown in Fig. 158, where it will be noticed that flyers are carried up as far as AC, when two semicircles are struck tangentially to the outer and inner strings. The distances AB and CD and ABF and CDE are divided into any convenient number of parts at the points 1, 2, 3, and 4, when by joining 1,1, 2, 2, etc., the outlines of the stairs are found. Where sufficient space is obtainable the Open Newel is undoubtedly the best style of staircase. Fig. 166 is an example of this kind, but they may be better arranged with frequent landings, often between two straight flights as well as at changes of direction, thus making them easier and less fatiguing to mount. This is the style usually adopted in large houses, when they are frequently of massive construction and elaborately decorated. Another kind of staircase is that known as Geometrical, on account of the plan assuming a geometrical form, and the setting out requiring the application of geometrical principles. One example of this kind is shown in Fig. 169. 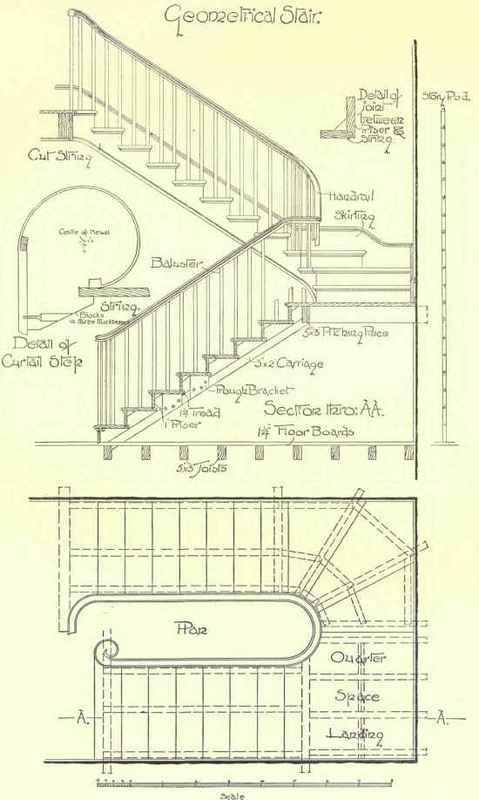 The essential difference between these stairs and those previously described lies in the fact that dog-leg and open newel are dependent upon the use of newels for their construction, whereas with geometrical stairs no newels are required. They may occasionally be inserted by way of extra ornamentation, but that is all. In the case shown in Fig. 159 the plan of string at the ends of the well hole is semicircular, and the string is continuous from top to bottom. Quarter-space landings are sometimes introduced, but more frequently winders are carried right round. Better foothold can be given on these winders than in the case of newel stairs, as the treads do not require so much diminishing. Winders are set out in all cases on what is known as the Walking Line. This is an imaginary line drawn parallel to the centre line of the hand-rail, and 18 inches from it. Winders should not be set out so that the riser comes in the angle between walls, as they are more difficult to construct there, and not so satisfactory as "kite" winders, which are shown in Figs. 157 and 159, and are much better. To accomplish this, an odd number of winders must be arranged in each quarter space. The tread of a winder at the walking line may exceed but must never be less than that of the flyers, and it will be found in practice that most ordinary cases will be met by three winders for the quarter and six for the half turn, especially where diminished flyers and dancing steps are used. Under the same heading may be placed Circular stairs, which consist of a well hole circular on plan, and consequently having all the steps winders. The outer string may be also circular, but it is more often square or octagonal. "Spiral" stairs or "circular newel" stairs, as they are sometimes called, are similar. These are also constructed of all winders, radiating from a centre newel to which they are all framed. They are seldom built of wood, however. Although no fixed rule can be laid down for the building of any of the foregoing staircases, each having to be treated according to the exigencies of the case, there are numerous details of construction applicable and common to all. Before a staircase can be set out the requisite particulars must be obtained from the actual building. For this purpose a "Story rod" is used, which is a light rod about 1 1/4 or 1 1/2 inch square, and long enough to reach from floor to floor. As the rise of stairs between floors often varies, a separate story rod for each floor should be used, each being carefully indicated. 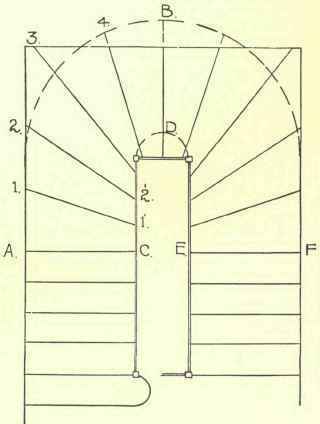 In taking the dimensions the rod is placed against a joist in the upper floor in the well, or "stairway" as it is sometimes called, and, being "plumb" on to the floor beneath, a mark is made on it at the level of the upper floor. This should be marked up, and gives the rise. The going is obtained by placing the end of the rod against the wall and marking the distance to the joist or landing trimmer, as the case may be. Notes should be made of any doors or windows close to the staircase. The rod is afterwards divided with compasses into the number of steps required. There will always be one more riser than treads in a flight, the landing forming the tread to the last riser.